And the beat goes on. And on. At least for members of Winter Percussion. They are prepping for their season, with auditions on Nov. 15, 16 and 21 at Plymouth. Interested students should show up in the band room 5:30 – 9 p.m. The tentative schedule for the season may be found at pcmb.net. 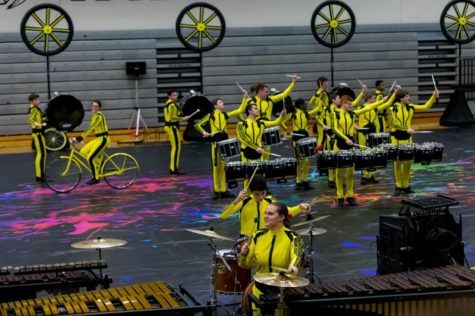 According to Director James Sparling, Winter Percussion is an extracurricular activity that runs from mid-November to mid-April where students can explore their interest in music through battery and front ensemble percussion. The battery consists of drummers and cymbal players that march while the front ensemble consists of keyboard and accessory percussionists that do not march. Even though these two main sections do different things, all students work together to learn and perform the same show. Austin Luttermoser, Plymouth senior and last season’s drumset player said, “I’ve been in both the battery and the front ensemble during my time in Winter Percussion, but I had a lot of fun in both sections.” Luttermoser also said that he enjoys the feeling of having the group’s hard work pay off at the end of each season. Not only is Winter Percussion an activity to expand a student’s musical knowledge, but it is also a great environment to make friends. Colin Hoffman, Canton senior and quad player, said that he has made almost all of his friends in Winter Percussion because new students join every year and he seems to click with everyone there.